Eastern Bulgaria is slowly recovering Wednesday after being hit in the beginning of the week by a heavy, early snow storm with gusty winds. 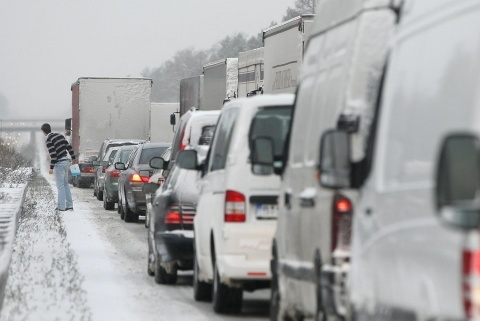 All roads in the country are passable, but the Shipka, Zlatishki, Tvardishki and Vratnik mountain passes in Stara Planina are closed. Traffic in the Mountain Pass of the Republic is allowed only one way at a time, which has created long lines and congestion. 234 villages and towns are still without power with the most serious situation reported in the central Gabrovo Region. Civil Defense inform that there are no more people being stuck in their vehicles or in trains and all have been rescued and transported to safe places. Transport Minister, Ivaylo Moskovski, traveled in person Tuesday to the mountain railroad station of Plachkovtsi near the town of Tryavna to head the rescue operation of people being blocked in a train for 24 hours, after inclement weather caused the State Railroad company, BDZ, to shut down all trains in northeastern Bulgaria. Rescue teams have pulled over 500 people, who were stuck in the heavy snow, in 38 cars, and 23 buses and minivans. Traffic police warn drivers who don't have winter tires and tire chains in mountain passes that they are going to face the maximum sanction's and fines.